Note: I also have a 4 GB micoSD card where I install all my none critical applications. The Following are Software I always Install they are not listed in any order just the order I remembered them. KaiserTweak is a little tool that tweaks some of your HTC Kaiser (P4450, TyTN II, Vario III) registry settings. Making it took several hours of my life, so you better enjoy it. Note that some tweaks may work on devices other than the Kaiser, but I've looked at the factory settings from my own Kaiser to get default values and such, so take care with other devices. Birthdays is a plugin for today screen which reminds you birthdays of persons in your contact list. This dll is very handy in that it lets you mark an entire folder as read by adding a "Mark All as Read" menu option. 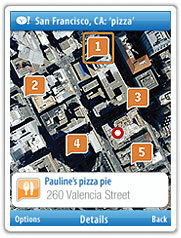 Find nearby business and restaurants and with one click start a phone call. Browsing through ratings and review and get turn-by-turn directions there. Find opening movie showtimes and local theatres where it is playing. Review movie descriptions to help decide. Quickly conduct your search by speaking or by entering a few letters and selected from predicted and previous queries. For me it is one word "Flickr"
Everything you need, all that you love. Yahoo! Go is today’s essential solution for anyone with a mobile phone. It’s an all-in-one offering that lets you enjoy the best of the Internet on your phone—for free. * Send an email, upload photos, download a map, search for answers, check stock quotes, or get breaking news—all that and much more is available through Yahoo! Go. *Your carrier’s standard charges may apply. Spb Phone Suite is a collection of all phone features you missed in Windows Mobile. 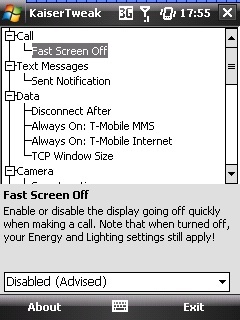 These are features like profiles, call filtering, missed call notifications, reject and reply with SMS, etc.